257 Blog Post Ideas For Stamping Business Owners | Stamping Is My Business! One of the biggest obstacles almost every stamping business blogger faces eventually is writer’s block. Try as they might, they just can’t come up with a blog post topic. It happens to new AND long-time bloggers, and it can be very damaging to your business. You see, when you miss a blog post, your readers lose a little bit of enthusiasm. So, unfortunately, does Google. As a result, your blog loses some momentum, and you can end up losing money! After doing Blogger’s Boot Camps for over 10 years now, as well as a Weekly Writing Assignment feature in the Business Stamper’s Coaching Group for over six years, I’ve come up with a LOT of blog post topics for my clients to use. 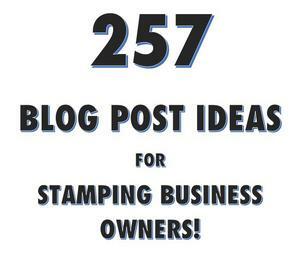 257 Blog Post Ideas For Stamping Business Owners! The ideas are sorted into categories (both crafting and business), and we don’t repeat a single one! You can use the topics verbatim, or use them for inspiration to spring into a different idea. You can get Instant Access to the E-Book for just $17! That’s a year or more worth of blog posts for less than $20! The link seems to be working for me. Would you mind trying it again?